Cass is delighted to announce the prize winners of the NMG Consulting prize for Actuarial Science in 2015/16. 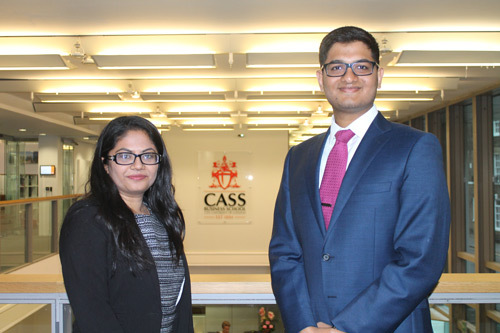 Ms Krishna Mepani and Mr Aditya Sanghvi, having scored the highest marks in the Actuarial Risk Management modules in the last academic year, will share the £2,000 NMG Consulting prize. This award, judged by Cass academics and sponsored by NMG Consulting, was open to students studying on the MSc in Actuarial Management. NMG Consulting is the leading multinational consultancy focusing solely on investments, insurance and reinsurance markets.